One of the best NHL officials and the 2012 NASO Gold Whistle Award winner. For 25 years, Terry Gregson kept watch over the ice as players like Wayne Gretsky, Mario Lemieux and Mark Messier battled for three periods – or sometimes longer. Gregson wore the stripes for the NHL from 1981 to 2004. He officiated 1,427 regular-season contests and 158 playoff assignments, including nine Staney Cup Finals. He served as president of the NHL Officials Association. Today, he’s a highly sought after speaker and clinician. At age 16, he earned his Ontario Minor Hockey Association referee card. He played hockey professionally in Europe for one year, but it was in the officiating ranks where he would rise on the ice. 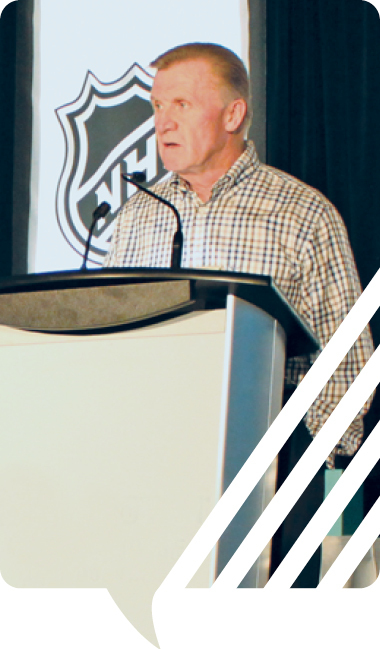 In 1978, he was hired by the NHL as a trainee and worked in the Western Junior, Central Hockey and International Hockey leagues. The former school teacher got his career break in 1979, when NHL Supervisor Scott Morrison hired him to work his way through the ranks. Two years later, he was assigned to work a NHL game between the Los Angeles Kings and Harford Whalers at Hartford, Conn. While the Whalers didn’t last in Hartford, Gregson lasted in the NHL. But his dedication to hockey didn’t end when he hung up his uniform, which bore number 4. He moved into an administrative position with the NHL, serving as senior vice-president and director of officiating from 2009-13. Received the Gold Whistle Award, officiating’s highest honor, in 2012. Officiated the 1994 Stanley Cup Finals when the New York Rangers won for the first time in 54 years – a game he considers the highlight of his officiating career. When he was 12, he faced the prospect of losing his leg. Doctors successfully removed a benign tumor. 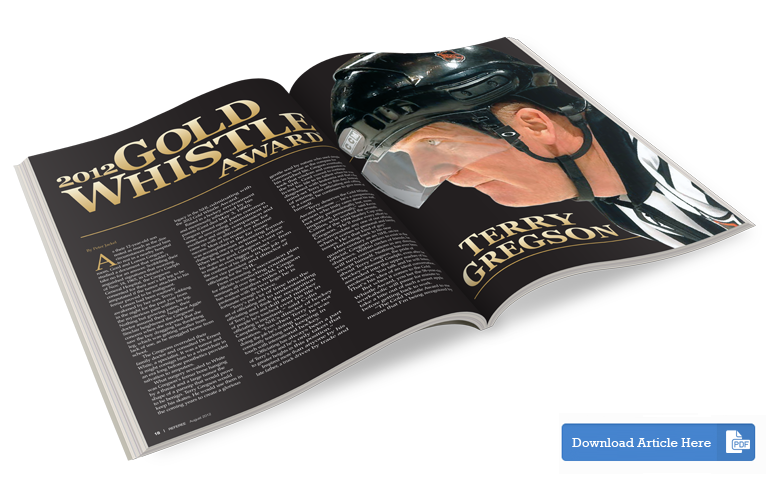 Terry Gregson appeared in a feature article in the August 2012 issue of Referee Magazine.